Johanna Eliot wanted to open a wine bar on Clifton Street. But provincial liquor laws wouldn’t allow one there. Serving food would circumvent that, so Eliot decided to go all in and open a restaurant: Eliot & Vine.The move came naturally. She also runs a company called Ocean Entertainment whose niche is producing food television shows. She’s worked with food personalities like Pete Luckett, Michael Smith, and Laura Calder.Besides being in a lot of different kitchens and seeing what works and what doesn’t, television has another benefit that carries over to real life. “To create food television, it’s about the beauty of the food and it has to look good,” Eliot says. “You can’t taste it as a viewer, but you want to eat it.”Head chef Brenan Madill employs uncommon cooking techniques, which can be time consuming. One example is sous-vide (sealing the food in plastic and cooking it in water or steam. The finished product is incredibly tender and cooked uniformly.) They do this with most of the restaurant’s protein offerings. 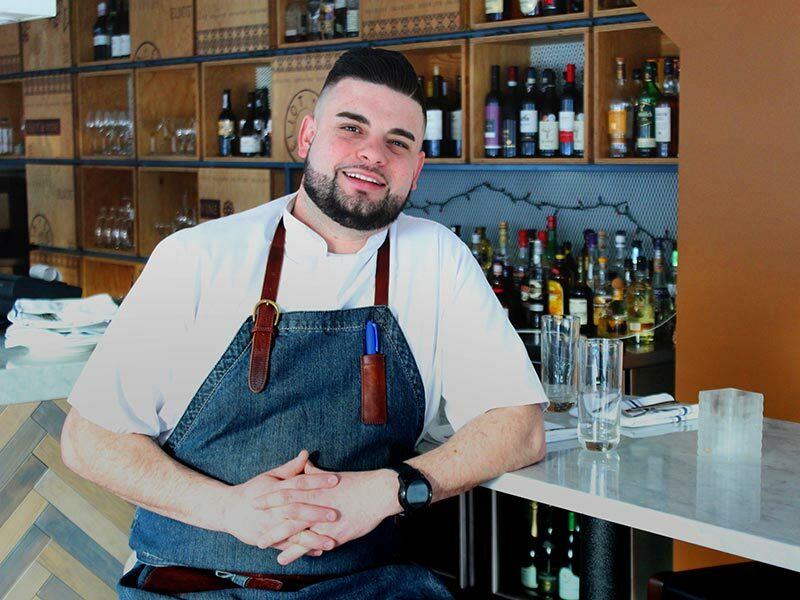 Chef Brenan Madill joined Eliot & Vine in January, launching a new menu showcasing local ingredients. Madill’s been with Eliot & Vine since January. Before that, he worked in kitchens in the Halifax area such as the Atlantica Hotel, Il Trullo, Cut, and Shuck Seafood. He also won bronze competing with Team Canada at the Culinary Olympics in 2016. For him, sourcing local ingredients is key and dictates what’s put on the menu. It’s also the reason why the menu changes with such frequency. Madill says sometimes Eliot will post an image online of a dish and in no time it will no longer be available. “That’s how it works. You buy enough product and when it’s gone, it’s gone. That’s it,” he says. One recent menu included offerings like lobster, pork belly, beef tenderloin, lamb and halibut. As part of Eliot & Vine’s focus on local, ingredients are sometimes sourced from a foraging firm, such as mushrooms, juniper berries, sea buckthorn and sumac. Foraged ingredients are appealing in part because it adds an even more local connection to the dining experience. “The more contact you feel like the person that you’re paying to do a task has with what they’re doing, the more interested and safe you feel as a customer,” says Madill. Glenn Anderson goes to the restaurant about twice monthly. The St. Margarets Bay resident makes the 30-minute trek so frequently that he’s become friends with Eliot. He loves the food and the presentation. “The prep and the plating is phenomenal,” he says. “Every time I’m there, I get a different plate.” He adds that the roasted hen and lobster risotto are his favourites. Eliot & Vine’s variation on the Waldorf Salad includes fermented grapes, local Blue Harbour Hip Hop cheese, and a buttermilk chive emulsion. Eliot & Vine’s décor has a distinct Mediterranean influence with its abundance of blue, tile and a marble bar countertop. Eliot grew up in Greece. The space, which is mostly a long rectangle shape, was designed by Breakhouse and Eliot. Wherever diners sit, they’re close to the bar, which pretty much runs the length of the room. “The whole restaurant flows around you,” Anderson says. In the summers, he loves how the large windows that front Cunard Street open to provide a breeze, while allowing diners to hear the sounds of the city. Given the restaurant’s name and its original vision as a wine bar, vino still plays an important role in the restaurant’s identity. The wine menu isn’t huge, but features a good variety at different prices, with a selection that changes frequently. Eliot & Vine also aims to minimize waste with its food ingredients. “Utilization of product is one of our biggest things,” says Madill. For example, if the restaurant buys chicken, the legs will be used for a dish like coq au vin, the breasts for something else and then stock will be made with the bones. If they make pasta and there’s some of it leftover, that will be turned into gnocco fritto. Going to Eliot & Vine is a surprise because it’s constantly changing, but its core values ensure you’ll have a great time. “It’s not just about the food, it’s about ambience, the servers, wine, the whole experience,” says Eliot.